Find out how easy it is to join the Lotto Premier. Read the latest news and results from the Lotto Premier. Congratulations to our latest car draw winner, Mrs P Straker from the Harraby area of Carlisle. As Mrs Straker was unable to attend the draw at Brunton Park, her lottery collector, Arthur Brown was a very lucky stand in! Thanks must go to former England cricketer, Paul Nixon for his help with the draw. Paul was at Brunton Park enjoying a “Boardroom Experience” Premier prize which his father Brian had won. The Brunton Park Development Association would like to apologise to all our members unable to purchase tickets for the Tottenham match on the priority sales days. Our management committee, sales agents and collection staff work hard to provide a positive experience and we are aware that on this occasion a number of people have not received the service they have been paying for. Last week we had 1486 paid Premier members generating valuable income which is donated to the youth department at Brunton Park on a regular basis. While many of these people have only joined to win our excellent car and cash prizes, receiving priority ticket status and Carlisle United membership are the reasons others signed up and these key benefits make our Premier product much more than “just a lottery”. We will continue to offer Carlisle United membership benefits to any of our existing customers. Anyone who would require this please can you contact me by telephone (01228) 526237 option 4 or email lottery@carlisleunited.co.uk. Please leave contact telephone number if no reply. I will then forward all the required details to the Carlisle United ticket office who will post out your membership card. I would like to thank everybody who has contacted me about their ticket purchases. It is only possible to put things right if we know there is a problem in the first please. Please do not hesitate to contact me, all feedback is very much appreciated. Thank you all for support. Let’s hope we get a great result against Spurs and the feedback received for ticket purchases in the next round is all positive. The Blues Lotto is looking for collection agents in the above areas. These positions involve no selling at all! It’s as simple as picking up subscription money from the local addresses we send you. If you have a friendly, outgoing personality and fancy a few hours work each week (ideal for active pensioners but anyone over 18 years old may apply). Average earnings are normally well above minimum wage, with the chance of bonuses too! For further details call (01228) 526237 (and press option 4). Please leave your contact details on our answering machine if no reply. James Copeland from Gretna was the £1000 Lotto Premier winner for March. 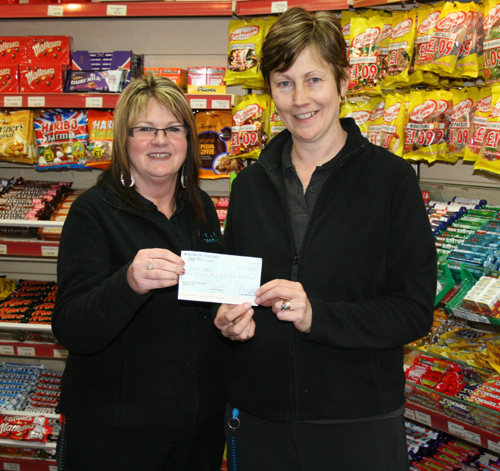 James pays his lottery membership at McKenzies Newsagents, Central Avenue, Gretna where staff members Gillian and Shona look after his cheque! Our latest car draw took place at half time during half time at the Yeovil match with David and Christine Beattie from Gretna winning a new Nissan Pixo car supplied by Benfield Nissan, Rosehill, Carlisle. Gordon Smith from Gretna is our £1000 Lotto Premier winner for February. 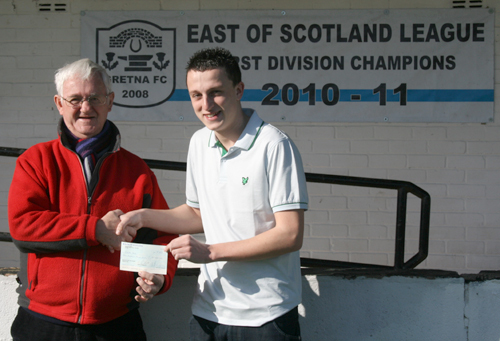 He is seen here receiving his prize from Dan King, one of the Blues Lotto agents for the area, at Raydale Park home of our Blues Lotto partner Club, Gretna FC 2008. 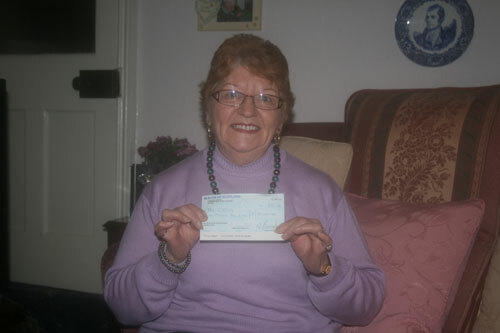 Our £1000 winner for January, Jean Irving from Longtown receives her cheque.